As we know, DVDs are easily scratched through frequent being inserted in and out of DVD drive, and finally will degrade over time. So, many DVD collectors are wondering if there is a solution enabling them to protect their DVD collection but at the same time to watch the high-quality of DVD content. Indeed, just convert DVD to MP4, their requirements can be well met. Follow this guide to fast convert and rip DVD to MP4 on a computer without quality loss in a breeze. Pavtube DVDAid is wonderful DVD ripper featured with powerful editing functions. With it, you can convert DVD to video formats like MP4, AVI, WMV etc with good quality and high speed. If you are seeking an easy and fast way to convert DVD to MP4, you are at the right place. Why is Pavtube DVDAid the best DVD to MP4 converter? Pavtube DVDAid can bypass almost kinds of DVD copy protection. It’s just a piece of cake for Pavtube to copy commercial DVD. And it can remove DVD discs region limitation for your better DVD movie enjoyment. As a professional DVD ripping application, Pavtube DVDAid could remove copy protection and region limitation and rip DVD to digital copy in 250+ formats. In addition, it allows users to adjust output video and audio parameters like video codec, audio codec, video size, bit rate, aspect ratio, frame rate, etc. If you want to choose subtitles and audio tracks from source DVD movie, you can also realize it with the best DVD to MP4 converter. It offers multiple tracks for you to select, making it friendlier to rip copy-protected DVD to those non-English speakers. It offers 3 different 3D modes: Side by Side, Top and Bottom, Anaglyph. Users are free to upload to YouTube 3D Channel, enjoy 3D movies on 3D TV, 3D projector, 3D galasses, etc. Now follow the fast and easy step-by-step guide to convert DVD to MP4 with Pavtube. How to Convert DVD to MP4 Using Pavtube DVD Ripper? Download Pavtube DVDAid to your computer, and double-click to install it. Now run the software. The program window will appear. Insert the DVD you wish to rip into the DVD drive and click "File"> "Load from disc" to load DVD from optical drive. If your DVD is saved as files on your computer, click "Load from folder" and browse to the folder that contains DVD files. Now all the episodes are imported to the file list. Click the Format bar, you can find MP4 format under "Common Video" or "HD Video" group. If the converted MP4 videos are for playback on portable devices, please find the corresponding group for your portable player such as iPad, iPhone, Samsung, etc and choose the customized format. Then specify an output folder to save converted videos. Now everything is ready for converting DVD to MP4. Simply click the "Convert" button at bottom right. You can view the conversion progress on popup window. If you would like to combine all the chapters into one file, please check Merge into one file. Read More: Why Do You Need to Convert DVD to MP4? DVD disc offers high storage capacity to store any kind of digital data, and allows us to watch content in the disc via DVD players. However, it also has some defects that push many people to rip DVD to digital file (MP4 is preferred choice) and save it into other storage devices. # DVD is easily broken. Children always break DVDs. So do adults. DVDs are vulnerable to warping, scratching, and breaking when aged, and stored or used improperly. When a disc is damaged, several or hundreds or thousands of sectors will become unreadable. # DVD occupies much space of our room. DVDs are cumbersome to store, thus becoming a headache for those who have collected an enormous number of DVD discs. They desperately need nice DVD storage ideas and are often suggested to convert DVD to MP4 or other digital files, in that this method can help save much room space and find target item easily. # Regional lockout causes DVD won't play error. Virtually all commercial DVDs have region codes which only permit the discs to be played on DVD players that have the identical codes. For instance, if you live in America (where DVDs and DVD players have a region code of "1") and purchase a DVD from British (where region 2 is employed), you probably fail to play it on your player. # DVD playback requires DVD drive and MPEG2 decoder. Nowadays, we have various electronic devices. However, most of them, for example iPhone 8/X, lack the ability to play DVDs, because of the absence of DVD drive and MPEG2 decoder. # MP4 takes up less space than others as keeps high quality. # MP4 is easy to store and manage, and hard to be corrupted. A digital MP4 copy is much easier to store and manage. You can save it to computer hard drive, external hard drive, flash drive, iPhone, Android, etc. Besides, you can categorize all the MP4 videos ripped from DVDs by genre, by year, etc, and name them according to your own needs. When you need certain file, you can locate it effortlessly from well-organized list or by searching. # MP4 is accepted by almost all devices and programs. MP4 is compatible with almost all electronic devices, including computers from different brands, Apple iOS devices, Android phones and tablets from Samsung, Google, HTC, Microsoft, Sony mobiles, tablets, game consoles, and so on. That is to say, after converting DVD to MP4, you can keep MP4 copies with you and watch them on the train, airplane, bus, etc. 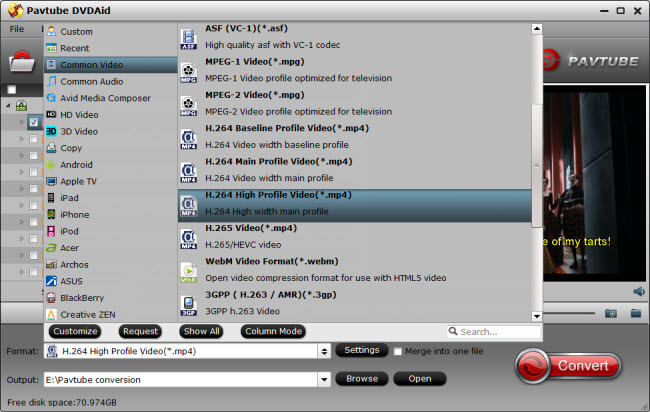 In addition, MP4 is accepted by many software programs (e.g. 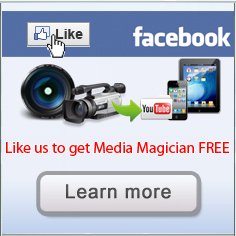 iTunes, iDVD, iMovie) and web services (e.g. YouTube, Facebook, Vimeo). So, you can do more things you like.